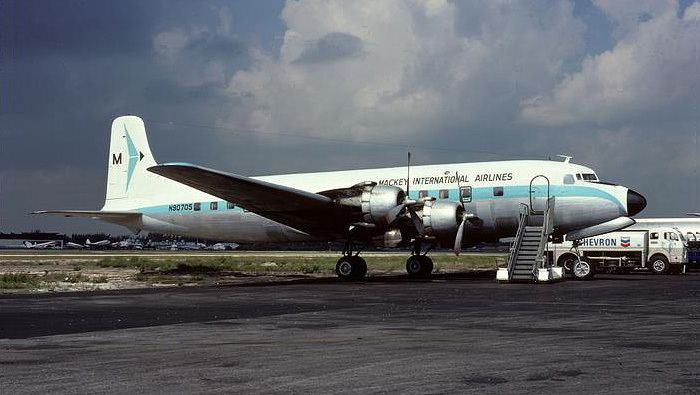 Mackey International Airlines Douglas DC-6 N4354B (msn 43546) pictured at Miami in May 1977. This aircraft was built for American Airlines and left the factory on October 21, 1951. It flew with Mackey from 1976 to 1979. 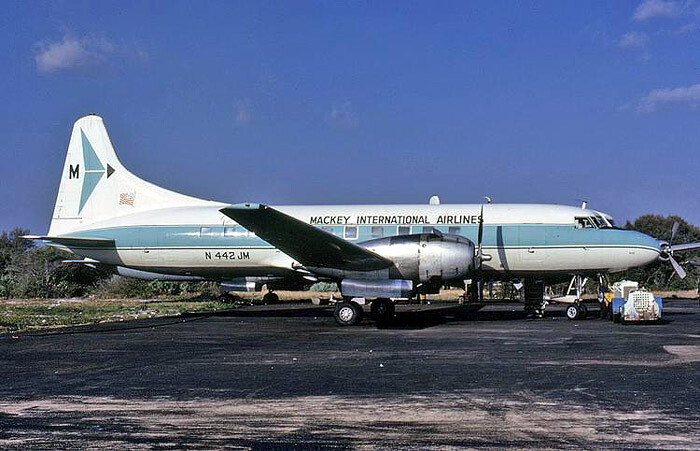 The original Mackey Airlines was formed by Colonel Joseph Mackey in 1946 and was merged into Eastern Airlines in early 1967. 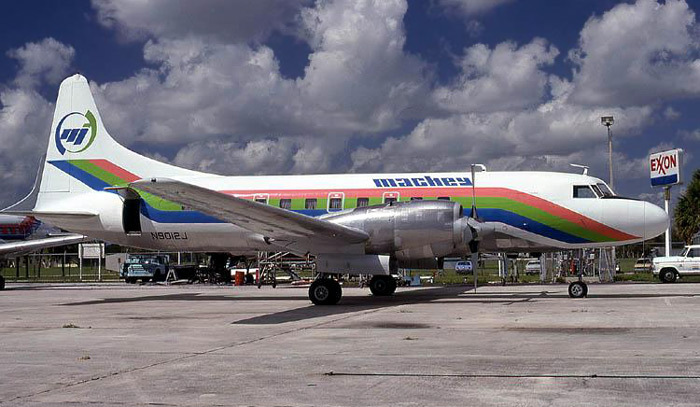 Colonel Mackey started a new commuter carrier, Mackey International, on February 1, 1969, eventually creating a large route network that served the Bahamas and the British West Indies from the Florida gateways of Miami, Ft. Lauderdale and West Palm Beach. The airline merged with Charter Airlines in 1979 and discontinued all flights in 1981. Aircraft types operated: Beech 99, Twin Otter, Convair 440, Convair 340, Shorts Skyvan, Douglas DC-6, Piper Navajo, Convair 580, Douglas DC-8. 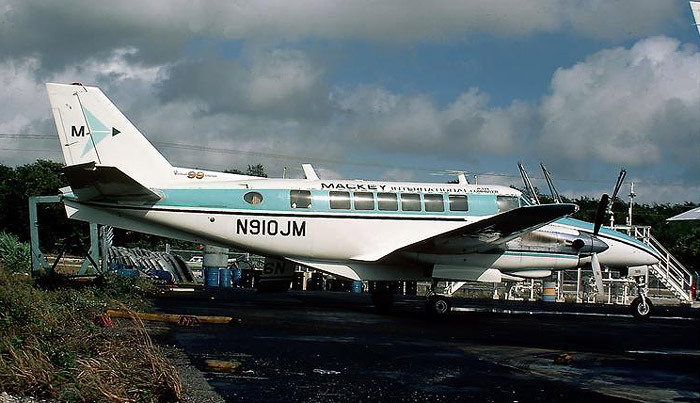 Mackey operated 3 Beechcraft B-99s from 1969 through the early 1970s. N910JM (msn U-40) is seen with Mackey International Air Commuter titles. Convair 440 N442JM (msn 438) pictured in 1973. 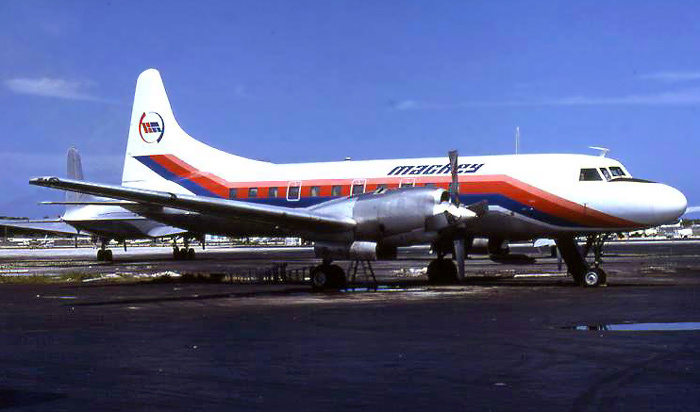 Mackey International was one of the last airlines in the continental U.S. to operate Douglas DC-6s in passenger service. N90705 (msn 42858) is seen here in 1974. Route map dated June 15, 1974 showing Mackey's extensive route system with service to 17 destinations. 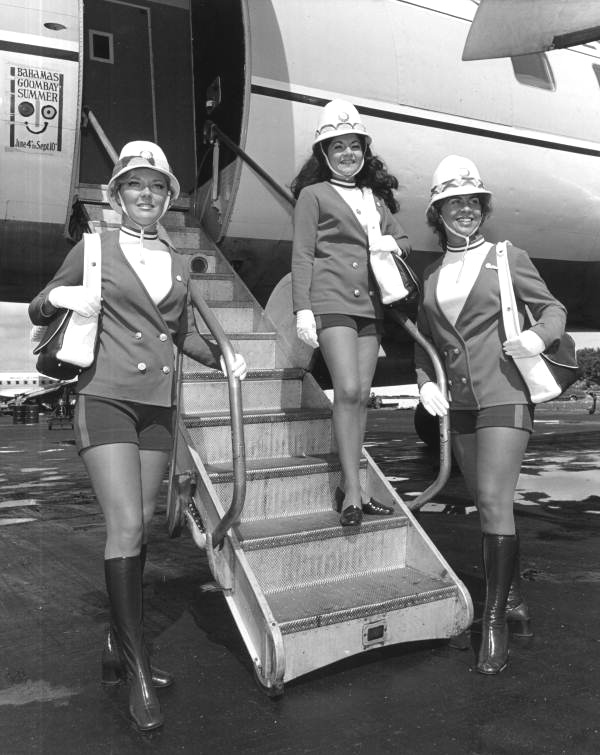 Here's a great shot of Mackey stewardesses modeling the latest uniforms at Fort Lauderdale in 1972. This photo comes from the State Archives of Florida photographic collection. This photo of DC-6 N4354B (msn 43546) at Treasure Cay was sent in by Sandy Estabrook, webmaster of Motu Iti, a website about French Polynesia as well as Abaco Bahamas. This aircraft left the factory on October 21, 1951 and was delivered to American Airlines as N90763. Sandy also sent in this photo of the aircraft cabin. Thanks Sandy! 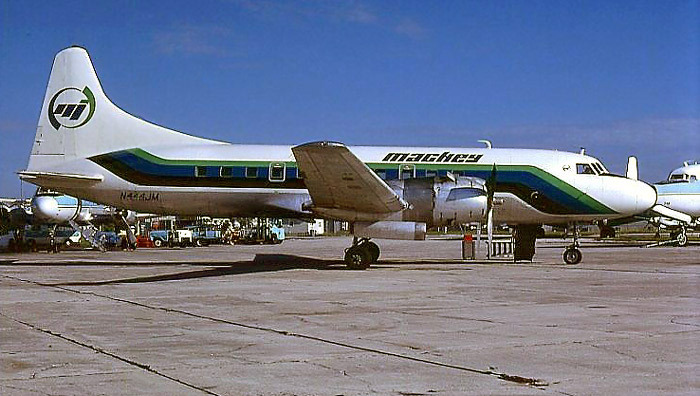 Mackey merged with Charter Airlines in 1979 and inherited a pair of turboprop Convair 580s as well as a Piper Navajo. This shot of N900WC, taken shortly after the merger, shows the aircraft in Charter colors with "CA" tail logo and Mackey titles. This plane went on to fly with Prinair. Convair 580 N9012J displays a variation of the above color scheme, with revised colors and "Mi" tail logo. Convair 440 N444JM sports yet another variation of the Charter/Mackey paint scheme.